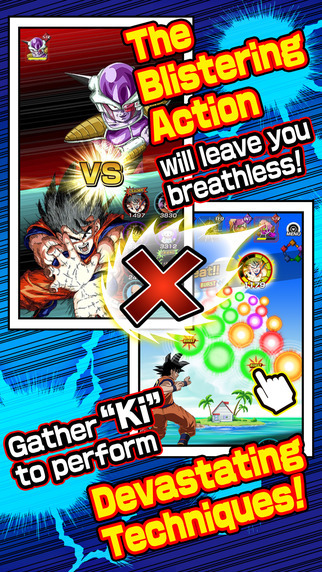 Simply tap the Ki Spheres on the screen to engage in supersonic combat! The fighting is so extreme your screen won't be able to handle it! 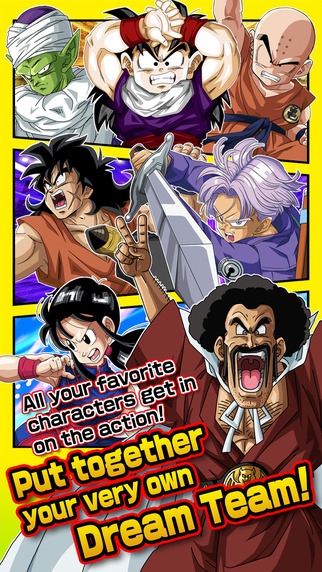 Awaken the true potential of your favorite Dragon Ball characters and make them stronger than ever before! Youve never experienced Dragon Ball like this! The story begins when Trunks Time Machine crash-lands on a planet where the Dragon Ball timeline has been thrown into chaos! Who could be behind this sinister turn of events? Work together with Trunks to get to the bottom of this mystery, battling legions of familiar foes along the way. 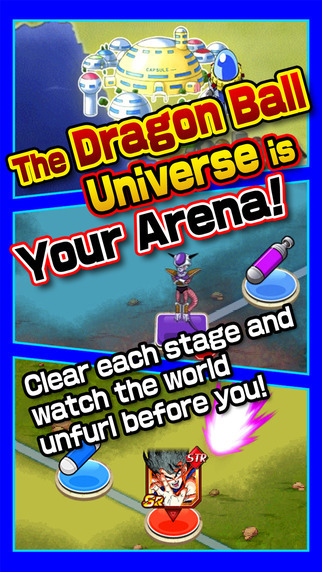 The very fate of the Dragon Ball universe rests on your shoulders! This application currently does not support the Ask to Buy feature included with Family Sharing. As a result, using this feature to make an in-app purchase on a device with Family Sharing enabled may result in an error. We ask that you do not use the Ask to Buy feature when purchasing items until we have updated our application to support this feature. (1) Operation is not supported for the models and OS versions other than those recommended. (2) Depending on your usage, there may be cases where operation is unstable even with the recommended models. (3) Regarding recommended OS versions, although it says [iOSXXX or later] this does not guarantee that it will support the latest OS version. This game contains some items available for in-app purchase that can enhance gameplay and speed up your progress. In-app purchases can be disabled in your device settings, see http://support.apple.com/kb/HT4213 for more details. Game(C)2015 BANDAI NAMCO Entertainment Inc. If any of you haven't found this out then I guess I'll tell you, (from what I've heard) we will be having a DOKKAN Festival in 10 days (the end of anniversary countdown) and there will be a new character, this character was also the ORIGINAL fusion of Goku and Vegeta, with out the potara earrings, Super Gogeta. More Apps by BANDAI NAMCO Entertainment Inc. Seller: BANDAI NAMCO Entertainment Inc. Requirements: Requires iOS 6.0 or later. Compatible with iPhone, iPad, and iPod touch.